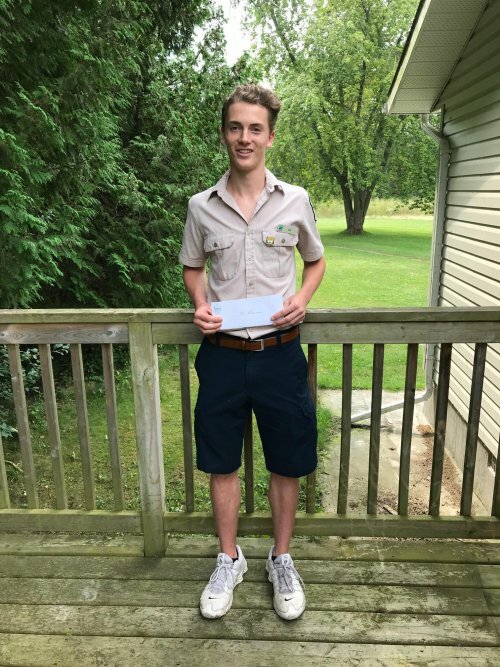 The Friends of Presqu’ile Park sponsors an annual bursary program to recognize the efforts of the fine young people who work as summer student employees in Presqu’ile Park. We received many examples of extraordinary dedication and stellar customer service from the nominations. Here are our winners. The Friends invited student employees to apply for our $1,000. Career Bursary if they were following a course of study at the post-secondary level that might lead to a career in the Parks system. Congratulations go to Rachel Siblock, the Lighthouse Gift Shop Attendant. Rachel has been accepted into the Master of Environmental Science Program at the University of Toronto. Rachel will focus on the twin fields of Conservation and Biodiversity during this 16 month program. Rachel hopes to use her education to participate in conservation and environmental management projects to ensure that our parks continue to provide an ideal habitat for local flora and fauna in the face of climate change and human development. Rachel Siblock receiving her bursary from David Crouch, Treasurer of the Friends and Joyce Boucher, Gift Shop Coordinator. The second Bursary program awarded four $500.00 bursaries to deserving students in each of the four Park staff areas. Students could be nominated by the public, their peers or a supervisor for demonstrating skills and actions to improve the park experience. We received many nominations for each department – a good indicator of the calibre of our student team. Robert Ormston is the winner for the Natural Heritage education (NHE) department. Robert impressed his nominators with his enthusiasm and knowledge. One co-worker noted that Robert takes extra time to ensure every guest has an unforgettable time at the Park. Robert will be continuing his studies at Trent University where he is entering third year of a Bachelor of Environmental Science program. Alana Bellamy was selected as the winner for the Maintenance Department. Her strong work ethic and commitment to doing a great job were noticed by everyone. Her resilience, kindness and quality of work were traits identified by her nominators. Alana is entering the Nursing program at Loyalist College this fall. Christie Mutton is our winner at the Gate where she has been cheerfully greeting Park visitors for the past five years. She excels at customer service, even remembering customer’s names. She is a great role model for new staff members. Christie is taking a Concurrent Education and French BA at Brock University. Eli Shannon from the Park Store caught the attention of more than one Park visitor who commented on his courteous and respectful manner and who went out of his way to help visitors have an enjoyable stay. Eli is a talented athlete who is heading to York St. John University in the UK to pursue a Bachelor of Sport Science and play soccer. The Friends of Presqu’ile Park wish all of our winners a very successful year and we look forward to welcoming them back next season.